I’ll bet you’re the kind of gardener who cuts down all old plant stalks, rakes up every frost-burned leaf,and makes your garden bed tidy each fall. No? Well if you are there are good reasons to change your garden maintenance schedule and wait until spring to spruce things up. Trees, ground cover, butterflies, birds, and other creatures that enjoy our gardens all summer need us to work on a four-season schedule. If we make things too neat, we eliminate much of the food and shelter our plantings could provide in winter, when some creatures need them most. Summer’s flowers shrivel into seed heads that feed gold finches, chickadees, nuthatches, downy woodpeckers, and sparrows in the cold weather while stalks and grasses provide havens for beneficial insects in hibernation. Decomposing plants and leafs fertilize the ground for next season’s plantings and prevents oil run-off. In addition, dried flower heads and stalks poking out of the snow make for a pleasing site adding color and structure to the landscape. A single bee balm head holds between 80 to 110 energy-packed seeds for backyard birds. Other plants, such as goldenrod, aster, and coneflower also produce abundant seeds. Annuals such as zinnias and black-eyed Susan’s, too, are a “feast on a stick” for birds. Many kinds of native bees, such as bumble-bees, mason bees, and leaf-cutter bees, overwinter in the garden clutter. Many butterfly species benefit from the not-too-neat approach, some overwintering in piles of leaves, other in natural cavities. Leaves hold butterfly chrysalises and beneficial bugs such assassin bugs and ladybugs which need layers of leaf litter to survive the cold. “Leave your garden messy” is the new mantra for gardeners who take the year-round prospective. There’ll be time enough in the spring to do the cutting and clearing that make way for spring and summer blooms. In fact, the messier the garden in winter,the more wild things we’ll see next year. Fall in Northeast Ohio offers many beautiful and vibrant colors along the tree line. Often those colors create a scene that could easily be mistaken for paint on a canvas. Soon those beautiful colors paint the ground and so begins the yearly labors of picking up leaves before the first snow blows. Some residents may be inclined to simply blow their leaves into the lake or culverts. When leaves are blown into the lake, the leaves accumulate on the water surface, especially in the backs of coves and along certain areas of our shoreline. As the leaves begin to decompose, the leaves will accumulate on the lake bottom around docks and places where people swim and fish. The decomposition of the leaves is what eats up dissolved oxygen (DO), which degrades water quality. It makes for a very rotten, squishy, unpleasant lake bottom. The depletion of dissolved oxygen (DO). Nutrient overloading, which later leads to algae blooms. Filling in of lake and cove areas. Not blow leaves or grass clippings into the culverts, street or lake. Mulch your leaves when mowing. Mowing more often will make it easier on you and allow your mulching mower to do the hard work. Think of the mulched leaves as tea leaves. When they are mulched into small pieces, the nutrients can be extracted much easier by water or rain and feed the soil reducing the need to use commercial fertilizer. And it’s free! Bag your leaves each fall before they blow into the lake. USE our COMPOST SITE. This is a great Roaming Shores resource! With the help of all our residents and continuing to act a stewards of Lake Roaming Rock, our combined efforts will continue to maintain and improve our water quality. Nutrients, primarily nitrogen and phosphorus, are key ingredients in lawn fertilizer. When it rains, fertilizer applied to lawns can wash into nearby storm culverts and streams that flow into our lake. Nutrients contribute to algae blooms, excess weeds, rob the water of oxygen, and threaten underwater life. Skip the spring fertilizer, especially if your lawn is healthy. Fertilizing lawns in spring promotes excessive top growth at the expense of roots. Sharpen lawnmower blades. A dull blade tears and weakens the grass, opening it up to disease. Many local hardware stores or garden shops can sharpen your blade for you. Raise the cutting height of the mower. Taller grass shades out weeds and needs less water. A three-inch cut length is ideal for most lawns. Leave grass clippings on the lawn. They provide free fertilizer all season long. Follow the directions on the fertilizer bag. Do not apply phosphorus to lawns unless a soil test indicates that it is needed. Clean up any fertilizer on driveways or other impervious surfaces. Keep fertilizer applications 10 to 15 feet away from waterways. Do not apply fertilizer if heavy rain is expected. Love the Lake and be lake responsible. Goosebusters: Good job so far! I have begun to see goslings hatching out around May 1st. We did a pretty good job neutralizing the goose nests that were located earlier thanks to the support and reports we received from many concerned residents. Now and through June is the time to be vigilant in watching for goslings and begin harassing them the day they show up. The longer you wait, the harder our job is to get rid of them. According to Geoffery Westerfield of the ODNR, harassing the goslings is very important for limiting the number of resident geese on our lake during the rest of the year. Separating the goslings from their parents even for a short time is an effective form of harassment. Geoffery advises that whenever you can, try to separate goslings from the adult geese by stepping between them shooing the goslings away from the adults by waving your arms and making loud noises (do not make contact). If you harass the goslings and adults together it is less effective and can even be counterproductive. Your goal is to send the message to the adult geese that your property is not a safe place to raise their young and to the goslings that Lake Roaming Rock can be a scary place. “Don’t stop anywhere short of the geese leaving your property”, says Geoffery. Simply chasing them to the water or the neighbor will not keep the geese off of your property (and is actually also counterproductive). Consistency and persistency is still key. Geese will “shift” around the property, especially those without goslings. Keep up the consistent and persistent harassment. June 1st is an important date. Geese will begin to molt (i.e. lose their flight feathers) around June 1st. If you don’t harass them off the property by that date, it becomes very difficult to remove them and you will likely be stuck with the geese till mid-July. Geese excrement is a contributor to the E. coli levels in our lake. In addition, it provides excess nutrients that feed the algae and weeds. We love our geese, but a few less wouldn’t hurt either. Thanks for being lake responsible! You have heard many statements linking manure from farm animals, and manure spread on agricultural fields to increasing phosphorous in our lakes and streams. But are you aware that waste from our pets can also be a source for nutrients as well as disease-causing bacteria and parasites that can get into our lake? In some articles, dog waste is cited as the third or fourth largest contributor of bacterial contamination in urban watersheds. Some estimates have an average dog generating a half to three-quarters of a pound of waste per day, or 270 pounds per year. Studies also indicate that 60% (or less) of pet owners pick up their pet’s waste. The EPA has indicated that 2-3 days of waste from just 100 dogs could generate enough pollution (nitrogen, phosphorous and bacteria such as E. Coli) to close a beach, and can affect the watershed for 20 miles. In researching this article, I found some other interesting facts. Unlike manure from cows, who eat a grass-based diet, dogs are fed a protein-based diet, which results in a highly acidic waste that will kill the grass if not picked up. It is also estimated that dog waste can take up to one year to completely breakdown. The natural ecosystem can only process and absorb the waste from two average dogs per square mile. If the ecosystem cannot absorb the waste fast enough, the bacteria and nutrients will be carried by rain into the watershed, and ultimately any body of water nearby (like our lake). What can you do? Pick up your pet’s waste. Even if the ground is snow covered, once thawed, the waste will still contribute to the problem. This is important not only on your yard but also in public areas (including RA lots), and on the street, where it can leach into the ditches along the roadways and end up in the lake. Remember, an unimproved lot is not an invitation for pet owners to skip the cleanup process. Once collected, most web sites recommend three options for disposal – flush down the toilet, bury in the yard, or dispose of in the trash. A “green” option often mentioned is composting. However, typical composting does not result in enough heat to totally destroy all harmful agents (bacteria, parasites) in the waste, so use caution. If the pet waste does end up in compost, it is recommended the compost not be applied to plants that will be eaten or are intended to be brought in to the home for decoration. So if we “doo” the right thing, we can help reduce another controllable source of pollution to our lake. But don’t forget, a barking dog is a good deterrent for the Canadian geese that are also part of the problem. Several articles have been written on this issue. A frozen lake is just one more sign that winter has come to Roaming Shores. It presents a snapshot in time of the beauty of the lake. Of course the lake does not completely freeze (thanks to the properties of water), and one never knows if we will even see the surface of the lake freeze this year. But if we do, you may be surprised at what goes on under the ice. A lake’s “winter” season is often identified based on the dates that the lake becomes fully ice covered. Once the lake is frozen, the entire ecosystem changes to cope with the colder temperatures. Of most importance to many of our residents is the effect on the fish population. Fish seek the warmer waters under the ice and can survive as long as the oxygen levels in the water are adequate. Since they are not warm blooded, their metabolism slows, including respiration, digestion and activity level. This state, called torpor, allows them to survive until the ice melts and the water starts to warm up again. Some amphibians survive in this state by first burrowing into the sediment along the lake bottom before “hibernating”. Macrophytes (aquatic plants) can actually handle the winter better than their terrestrial cousins if they are protected under the water. Some will form nodules, which can store energy while they wait for the sun to reappear. Some may go dormant. Some may die back, but their root systems may survive to grow again in the spring. While the lake drawdown can kill even the root systems if exposed long enough to the cold air, hopefully many beneficial aquatic plants will survive as they compete with the algae for the nutrients in the spring and summer. As far as microscopic organisms are concerned, they also adapt. Phytoplankton (photosynthetic organisms) such as cyanobacteria (blue-green algae), produce thick-walled cells much like a cocoon that will protect them in a dormant state until conditions are more favorable. Some species can survive by becoming cannibals and consuming other algae species for food. Zooplankton (microscopic animal that also eat phytoplankton) may also form a cocoon for protection. Like some of us, the lake’s many residents slow down their activity level during the cooler winter months and wait for the arrival of spring. How long has it been since you just stopped whatever you were doing to simply look out over our beautiful lake? 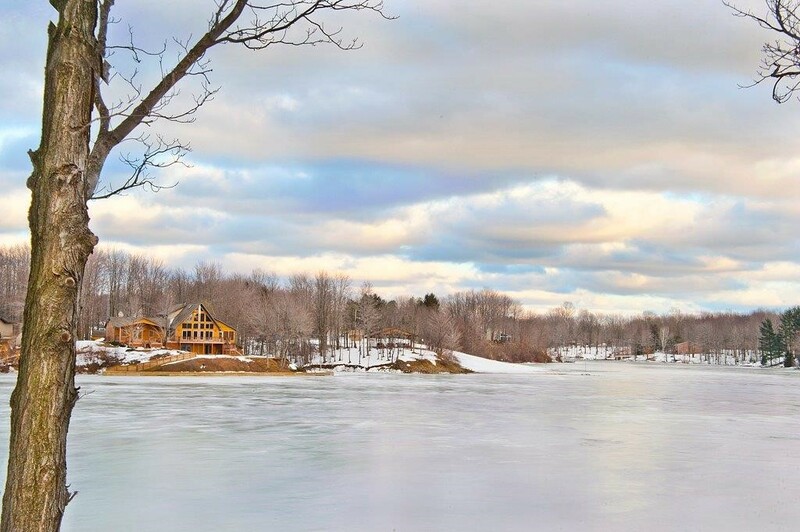 The winter snow may cause us some problems driving but it sure does paint a wonderful background for one of the most spectacular views along the shoreline of our lake. Whatever problems occupied my mind a few moments before simply disappear when I stare out over the water. I can’t think of another scenic view anywhere that rivals the one in our own backyard. This time of year allows me to reflect on the past year of the many great memories we each create here in Roaming Shores. Whether it’s jumping from a floating dock at one of the beaches, watching the wonderful fireworks over East Beach or laughing with neighbors while the sun sets behind the trees. I give great Thanks to those committee members whom have donated precious hours to help better our community and lake through the Lake Management Committee. I urge others to consider getting involved with the Lake Management Committee and sharing your skills and talents in the coming year. From your RomeRock Association Lake Management Committee, we wish you a very happy, merry and safe Holiday Season.